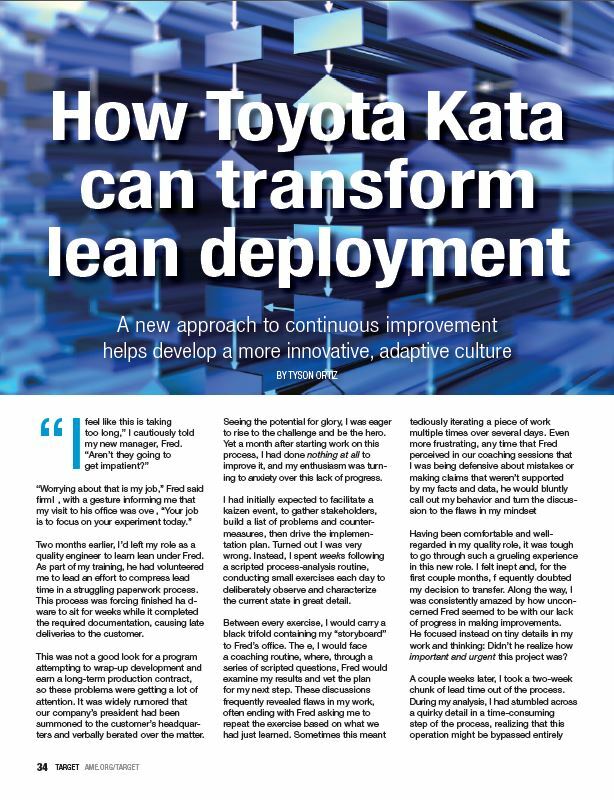 Toyota Kata was developed by Mike Rother, a researcher, engineer, teacher, author and speaker on the subjects of management, leadership, improvement, adaptiveness and change in human organizations. 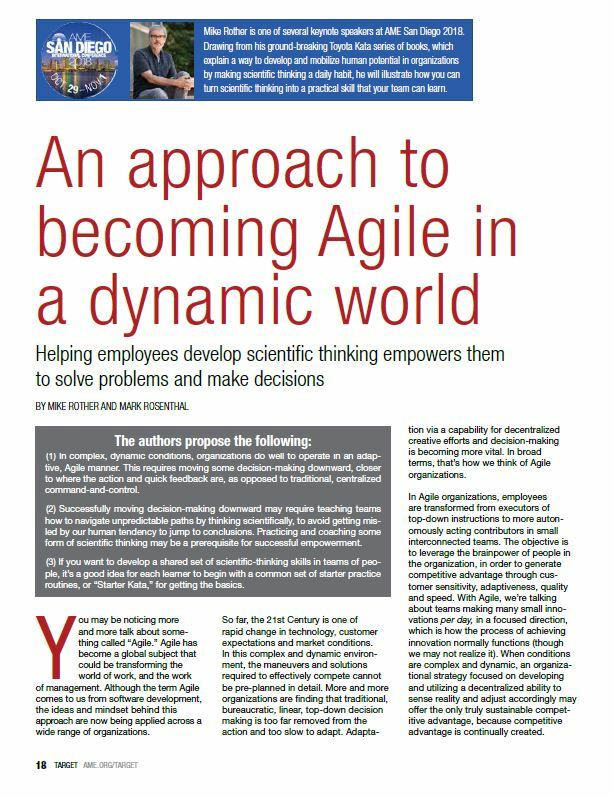 In his 2009 book, “Toyota Kata: Managing People for Improvement, Adaptiveness and Superior Results,” Rother describes Toyota Kata as a means for developing, activating and mobilizing human potential in a way that makes scientific thinking a daily habit. Understand the challenge. This is typically a large, big-picture goal that may seem or feel out of reach. It also defines the purpose or reason behind improvement. Grasp the current condition. This step invites users to ask, “Where are we now?” and includes the gathering of data and information that sets up the next step. Establish the next target condition. Where do we want to go? What do we want to achieve? 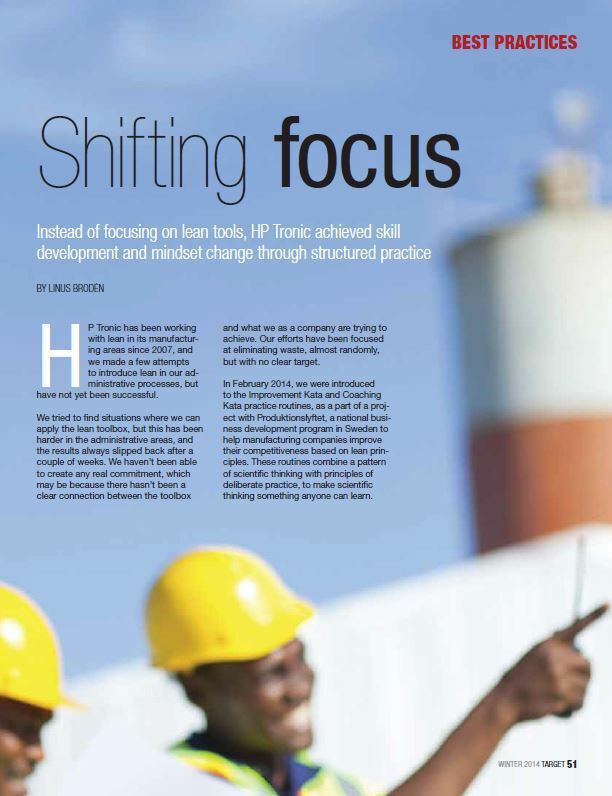 In this step, participants set tangible and measurable goals which include an achieve-by date, desired outcome and a general description of the process on how the target condition will be reached. Important to note, this step is part of the planning phase and is likely to change depending on the results of experimentation and achievement of milestones along the journey. Experiment toward the target condition. 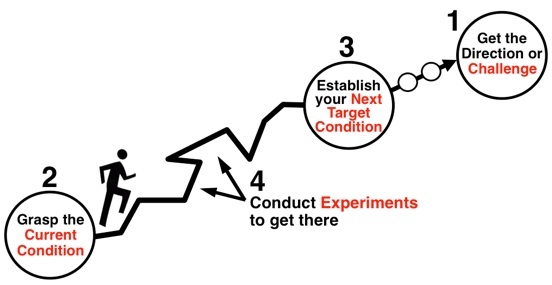 This step is part of the execution stage and includes the actions needed to reach the target condition. The path towards the target condition is typically not a straight line and usually involves obstacles. This step usually involves a process of rapid learning and discovery of the steps that are working and those which are not. In this step, adjustments are made on the way to the target condition. The steps outlined in the Improvement Kata are designed to help users, no matter which problem-solving or improvement method they are using. 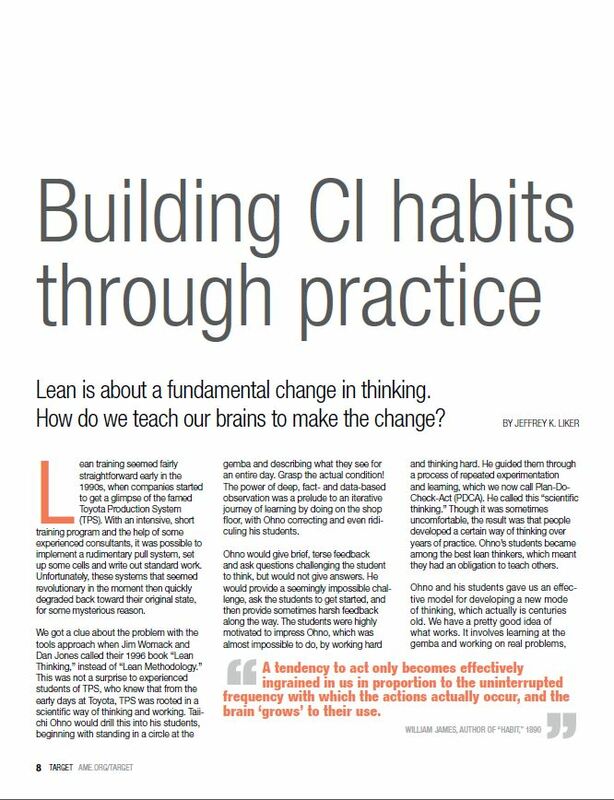 Implementing the Improvement Kata can be difficult because it often requires a new or different way of thinking and learners may revert to old patterns and habits. In addition, it can be difficult for learners to see where they are going wrong or making mistakes throughout the process. That’s where the other main element of Toyota Kata comes in. 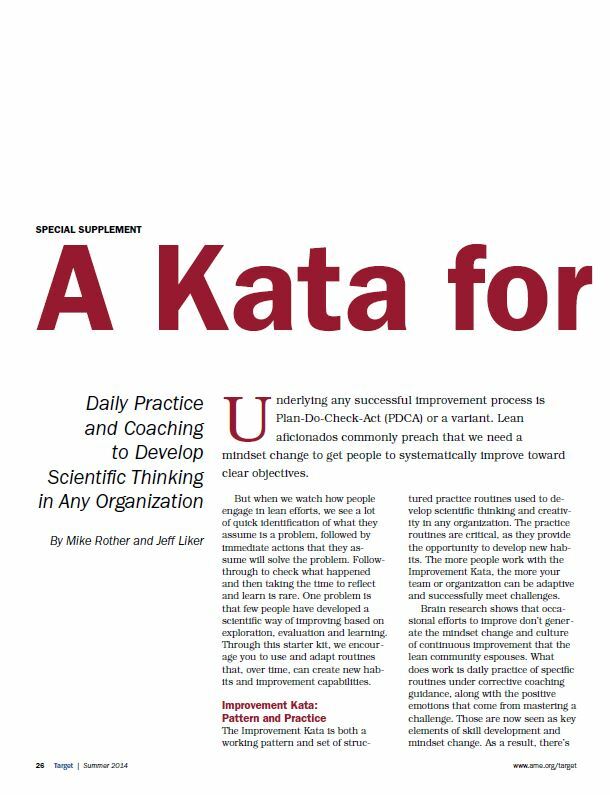 Known as the Coaching Kata, this element of Kata focuses on the practice of teaching the Improvement Kata pattern. An Improvement Kata coach helps provides guidance and support for learners and can help speed up the learning process. The coach helps the learner overcome setbacks, provides encouragement and has a vested interest in helping the learner succeed. Coaching however, also takes practice. - What is the target condition? - What is the actual condition now? - What obstacles do you think are preventing your from reaching the target condition? Which one are you addressing now? - What is your next step? (Next experiment) What do you expect? - How quickly can we go and see what we have learned from taking that step? 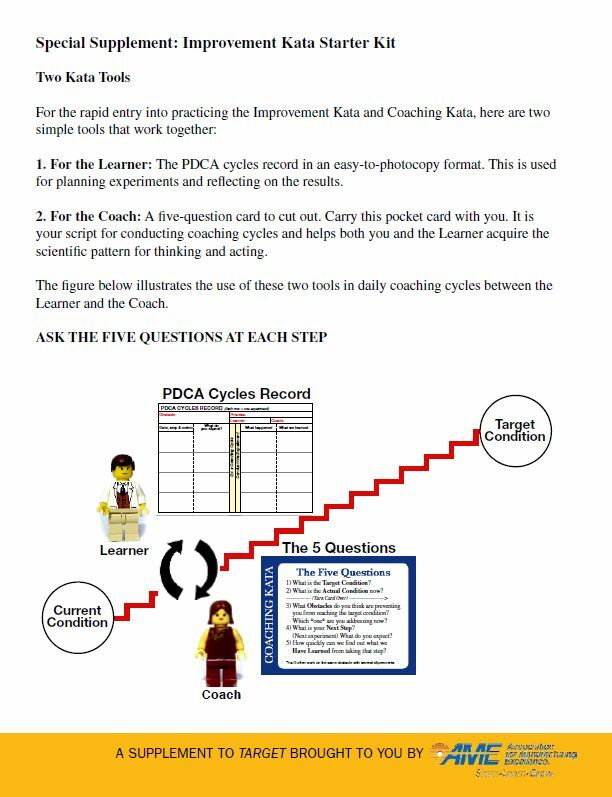 These questions, considered the coaching cycle, help reinforce the pattern of the Improvement Kata and helps reveal how the learner is thinking. Typically, this pattern of coaching includes asking a question, listening, comparing (the learner’s response to the desired pattern of thinking), and instructing. 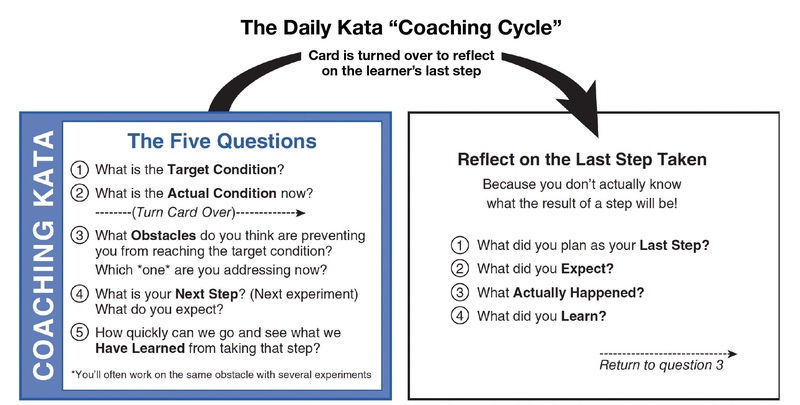 The use of these Coaching Kata questions takes practice. With feedback from a second coach, these skills can be improved and become more effective. 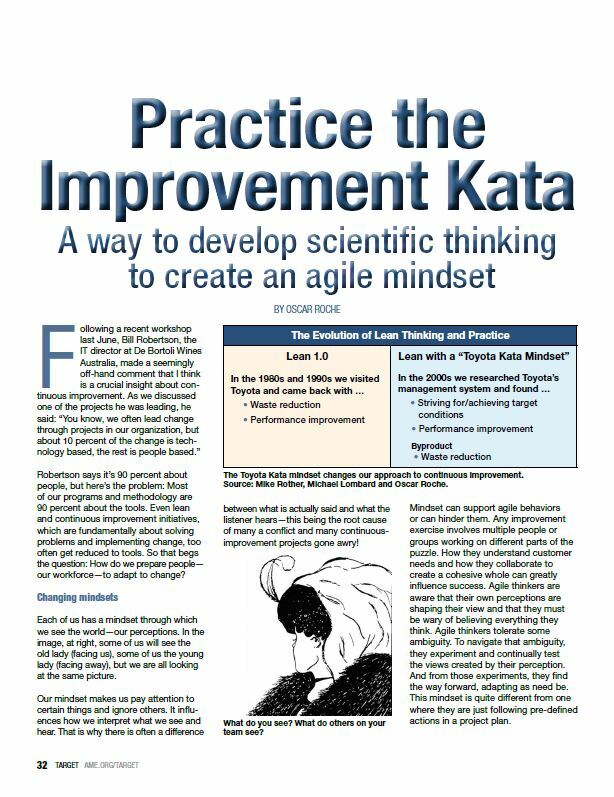 For more detail on how to develop the scientific thinking skills of the Improvement Kata or the coaching skills of the Coaching Kata, consult Mike Rother’s “The Toyota Kata Practice Guide.” For more information about Toyota Kata visit Mike Rother's Toyota Kata website. Don't miss the Kata Practitioner Day event at Fathom Consulting in Minneapolis, MN on May 1, 2019. The Online Improvement Kata & Coaching Kata Basics Course is a self-paced, interactive online course in 11 modules. It's produced by the award-winning author, professor and lean specialist Dr. Jeffrey K. Liker. The course shows you the steps and practice routines of the Improvement Kata and Coaching Kata. Normally an $80 program, AME members can access the Kata course for a discounted $70. Click the link below to check it out or to get started!